Another improvement in high pressure rotary sealing - Kalsi Engineering, Inc.
Kalsi Engineering, Inc. has increased the reliability of extreme high pressure rotary sealing by improving the extrusion resistance of the force balancing seals used with Kalsi proprietary floating backup rings. The floating backup ring allows the smallest practicable extrusion gap between the rotary seal and the shaft, which allows the rotary Kalsi seal to withstand higher pressures for longer periods of time. Equal hydraulic forces applied to the oppositely facing ends of the backup ring cause it to be axially force balanced. This axial force balance, coupled with the journal bearing relationship, allows the backup ring to follow lateral shaft motion, such as runout and shaft deflection. The floating backup ring is applicable to many different types of equipment requiring high pressure rotary sealing, including rotating control devices (RCDs), hydraulic swivels, side entry swivels, coaxial swivels, etc. You can read more detail about the floating backup ring in Chapter D17 of the Kalsi Seals Handbook. The axial force balance on the backup ring is made possible by defining a substantially equal hydraulic area on each end of the backup ring. These hydraulic areas are defined by three force balancing seals, and the Kalsi-brand rotary seal. See Figure 1. 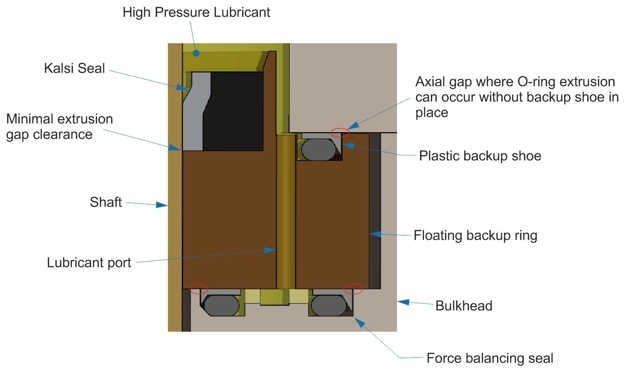 An axial port in the backup ring communicates the lubricant pressure from one hydraulic area to the other, creating substantially equal and oppositely acting axial hydraulic forces. Our testing has shown that when the force balancing seals are O-rings, they are susceptible to extrusion damage at extreme operating pressures. Figure 1 depicts the locations where O-ring extrusion can occur. The reason for the extrusion is the necessary axial gaps between the backup ring and the mating components. At extreme pressures, these gaps increase due to pressure-related component deflection. To address the potential for O-ring extrusion, we have developed a plastic backup shoe that extends performance of the force balancing seals in extreme operating pressures. The backup shoe has an axially projecting “skirt” that bridges the axial gap between the floating backup ring and the mating components much better than the O-ring alone. This is key to sustaining higher pressures for even longer periods of time, because the backup shoe prevents O-ring extrusion. Since the backup shoes have lower breakout and sliding friction than that of the O-rings, the bearing load between the shaft and the floating backup ring is decreased, providing an additional benefit. Testing of assemblies with the plastic backup shoes is demonstrating that the plastic backup shoes are performing their intended job and are very durable. For information on how this new technology can help you with your high pressure rotary shaft sealing problems, contact Kalsi Engineering.